Euro journos are quoting 350 liters for the boot space of the outgoing Auris; that's 12.3 cu ft and that does not include the space above the top of the seatback. So, IMO, that new Toyota Hatchback has most likely the exact same "trunk" space as a WRX or Impreza sedan plus an additional 6 cu.ft above that. That being said, Impreza hatchback has 20.8 cubic inch total; so, a little bit more space back there. But, that new Corolla has a significantly peppier engine; 168-hp is pretty much what the FB25 puts out in the 2011~2018 Forester. It's amazing how Subaru Honda Ford and VW and even Toyota had the spec of this type of car over 15 years ago and we're praising Toyota for bringing it back. Anyone who picks this over a heavily discounted GTI is mental. Even a Civic hatch is a far far better performing vehicle. That NA engine is not even remotely competitive with those two and disappointing Toyota chickened out with it. Perhaps they were afraid of offering a quicker everyman commuter hatch than their sport coupe 86. I agree. The Auris has been running around Europe for ages too. So, nothing new under the sun. I didn't even think we had to mention that one of them new Civic hatch would leave this new Corolla hatchback in its dust. But, then again, the GTI has so much more potential than any of these 2 that it almost seems unfair to even compare them to each other . This would be a fine commuter car. You could probably beat the hell out of it everyday without breaking the law or the car. Something about being able to drive a slow car fast daily is pretty enjoyable. Once you have serious power, you seldom get to use it without being a bit of a douche. This thing will also probably last forever even compared to 1.5t Hondas. My wife has a 17' corolla iM hatch 6mt - it's slow, but it has a very good chassis and the DWB rear is very planted when you push it - call it a momentum car I guess. If it had an LSD & turbo it would be a serious FF contender. If Toyota managed to stiffen the chassis more in this gen as claimed, I hope they give it the gazoo treatment and start smoking GTIs. This is the point...This car is not meant to be a GTI, nor does it have to be. A car can be fun, can be valid without having a bunch of power or super stiff suspension (which the GTI does not have), or this statistic or whatever. Sometimes, the freedom of driving a simple, reliable, well-built little car that can take abuse is a joy of it's own design. The problem with your comparison is the 700lbs of curb weight difference. I can make a similar comparison - my wife had a 5mt Yaris sedan (xd is the hatch with a scion badge & 1.8l) prior to the corolla iM hatch she does now - sub 2,300lbs and a 1.5l that was happy and quick to wind up to redline over and over again. I could have some fun in that car when compared to my wrx, a different kind of fun - the flat-footed redline hitting corners at 40mph and feeling like a god kinda fun; essentially driving a slow car "fast" kinda fun. The corolla hatch she has now, and the 2019 corolla, are in an entirely different weight class, and have much higher limits thanks to wider rubber, better suspension & brakes. The 1.8l "bread and butter" engine is sadness incarnate, but the 2.0l looks to be a much better affair. At around 3,000lbs, the go-kart like fun is not going to happen, because it's not small and it's not light. A performance version would be welcomed by many, I may even be able to talk my wife into one. Toyota is trying to get their mojo back, this might be one of the feathers they can put in their hat, and with the departure of the Focus ST it may be the right time - imagine Toyota reliability, and efficiency of production focused on a hot hatch; a base corolla iM is already better appointed than a GTi until you go top trim (save the LSD of course). More hot hatches is never a bad thing. This is why I daily an '05 Scion xB with 150K+ on the ODO. Damn car is the Energizer rabbit. The 2019 Toyota Corolla hatchback marks a big step in the right direction for a nameplate that has been known in recent years for its boring styling and driving dynamics. Now, Toyota has revealed pricing and fuel economy numbers for the Corolla hatch. The 2019 Toyota Corolla hatchback will start at $20,910, including $920 destination charge, for an SE model with the six-speed manual transmission. Meanwhile, the manual-equipped XSE trim level will start at $23,910. The CVT will be an extra $1,100 on either model. The Corolla hatchback’s starting price is $425 more than that of the Corolla iM it replaces, but it still undercuts much of its C-segment hatchback competition. The Honda Civic hatchback starts at $21,045, while the Mazda3 hatch starts at $21,285, the Chevrolet Cruze hatch starts at $21,320, the Ford Focus hatch starts at $21,415, and the Volkswagen Golf starts at $21,760. The Subaru Impreza five-door is slightly cheaper starting at $19,855, as are both Korean options. The Kia Forte5 and Hyundai Elantra GT start at $19,195 and $20,235, respectively. 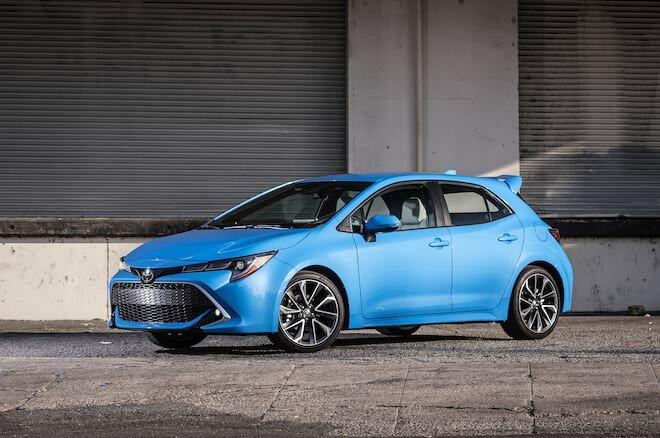 Options for the Corolla hatch will be relatively streamlined. All Corolla hatchbacks come standard with the Entune 3.0 infotainment system, which is compatible with Apple CarPlay and the Amazon Alexa voice assistant, but the SE Preferred package will get you App Suite and Toyota Connected telematics services and a blind spot monitoring system for $1,400. The XSE Preferred package includes a premium JBL eight-speaker, 800-watt audio system, Toyota Connected services, onboard navigation, and Qi-compatible wireless charging capability for $1,600. Adaptive headlights are a $415 standalone option, and the $395 Blizzard Pearl is the only premium paint color. Under the hood, the Corolla hatchback gets a naturally aspirated 2.0-liter inline-four rated at 168 hp and 151 lb-ft of torque. That engine can be pretty efficient, but just how efficient depends on the trim level and transmission choice. The Corolla hatch SE with the CVT is the fuel-miser of the lineup, EPA-rated at 32/42/36 mpg city/highway/combined. But that same drivetrain combo in the XSE, which rides on 18-inch wheels rather than 16s, only yields 30/38/33 mpg. The SE manual is rated 28/37/31 mpg, and numbers for the XSE manual are still pending. 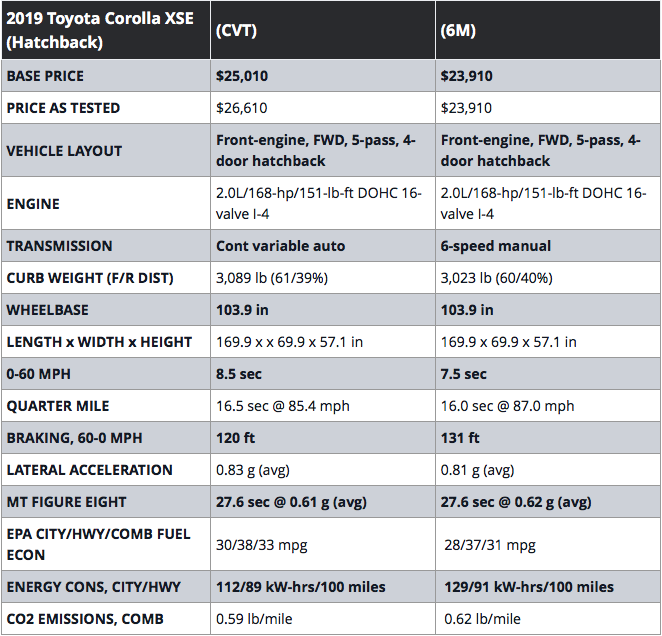 The base CVT Corolla hatch gets better mpgs than the most efficient Corolla sedan, the Corolla Eco, which is rated at 30/40/34 mpg. The 2019 Toyota Corolla hatchback goes on sale this summer. Mention Toyota Corolla to anyone, and the first terms they’ll likely use to describe the car would be fuel efficient, affordable, and, in the case of automotive enthusiasts, a boring appliance. With the exception of the rear-drive Corolla GT-S/AE86 (the spiritual ancestor of the Toyota 86) and the Corolla XRS of the 2000s, the Corolla never got anyone’s pulse racing. Toyota aims to change that with the 2019 model, which has an eye-catching exterior highlighted by an angry-squinty front fascia and rakish side profile. We tested two 2019 Corolla hatchbacks to see how they stack up against the rest of the class. Riding on the TNGA platform, the 2019 Corolla hatchback has improved body rigidity over its predecessor. Motor Trend testing director and figure-eight guru Kim Reynolds found the 2019 Corolla hatchback’s agility enjoyable. Although the car takes some prodding to get through a corner, Reynolds noted that the understeer isn’t excessive and it’s sensitive to steering inputs. The independent suspension setup gives the Corolla hatchback confident handling through corners. Body roll is minimal, making the car feel planted on the road. Although the 2019 Corolla hatchback has better driving dynamics than its plodding predecessor, it’s not perfect. The car’s chassis does a good job absorbing road imperfections and potholes; however, large bumps and dips can cause the rear suspension to bounce around, especially if you hit one when taking a turn at highway speeds. Steering feel could be improved, especially at high speeds where the weight of steering feedback barely increases. Despite its improved driving experience, the 2019 Corolla hatchback isn’t on par with the Honda Civic and Mazda3, both of which offer superior handling and more driver engagement. Furthermore, the Chevrolet Cruze and Volkswagen Golf/Jetta compact cousins offer a smoother ride. With 168 hp and 151 lb-ft of torque, the 2019 Corolla hatchback’s 2.0-liter I-4 is no powerhouse, but it’s enough to get you up a steep incline and pass slower traffic. You do need to rev the engine toward redline, as it doesn’t have much low-end torque. The standard six-speed manual has reasonable throws, gates that are easy to find, and an automatic rev-matching system that works smoothly and can be turned off with the press of a button. The clutch is light and vague, so it’ll take time to find where it engages. Road test editor Chris Walton observed that the manual clunks when shifted fast. A CVT is optional, but it features delayed responses and jerky fake shifts when left to its own devices or using the paddle shifters to manually change between 10 preset ratios . Sport mode improves throttle response, but it’s a little too touchy. The CVT provides superior fuel economy, at EPA-rated at 30/38 mpg city/highway in XSE guise or 32/42 mpg in the base SE. Opting for the manual drops those numbers to 28/37 mpg. At the track, the manual-equipped Corolla hit 60 mph in a spritely 7.5 seconds and finished the quarter mile in 16.0 seconds at 87 mph. The CVT-equipped tester was 1.0 second slower to 60 mph, but by the quarter mile it was only 0.5 second behind at 85.4 mph. On the handling tests, the manual-equipped tester generated 0.81 g of lateral acceleration, and the CVT-equipped car produced slightly more at 0.83 g. Both cars finished the figure eight in 27.6 seconds averaging 0.62 g and 0.61 g for the manual and CVT, respectively. Stopping from 60 mph took 131 feet on the manual Corolla and 120 feet for the CVT-equipped car. Walton observed a firm brake pedal with lots of vibrations, but dive was minimal and stability was good. He suspects that the lack of initial bite is the reason for the manual model’s long stopping distance. Inside, you’ll find soft-touch materials on the dash, upper door panels, center console, and armrests. Hard plastics are found in the rear passenger compartment and away from the touch points. The front seats offer good side and thigh support, keeping you in place on winding roads without making you feel confined on the daily commute. The front seats feel cozy because of the dash design, which pushes into occupants’ personal space. Rear seat space is only good for two passengers even on short trips due to the lack of knee- and legroom. Tire noise in our two testers was excessive due to the standard 18-inch wheels shod with Dunlop SP Sport 5000 performance-oriented all-season tires, and a fair amount of wind and road noise enters the passenger compartment at high speeds. Engine noise is minimal when you’re cruising, but it can get thrashy higher up in its rev range. If you find a competently produced interior to be acceptable, the Corolla Hatchback is fine, but if you want a bit more style and refinement you might want to compare it to the Mazda3. Cargo space checks in at 17.8 cubic feet behind the 60/40 split-folding rear seats. Even with the rear seats folded, the 2019 Corolla hatchback doesn’t have much cargo capacity, meaning the car’s styling comes at the cost of practicality. The Hyundai Elantra GT, Kia Forte5, and Subaru Impreza offer more usable space with the rear seats up or down thanks to their squared-off openings and the lack of intrusions into the cargo area. Those competitors offer over 50.0 cubic feet of cargo space with the rear seats down and at least 20.0 cubic feet with all seats in place. Entune 3.0 with an 8.0-inch touchscreen is standard on all 2019 Toyota Corolla hatchbacks. It now comes with Apple CarPlay but not Android Auto, meaning Android users must interact with the native system. Although the layout is straightforward, the system isn’t responsive enough regardless of whether you use the touchscreen, physical buttons, or voice commands. And the Scout GPS Link app locks you out of Bluetooth-phone voice-command functions when you have the map displayed on the touchscreen (loaded models offer an integrated navigation system). Although it’s the newest version of Toyota’s infotainment software, Entune 3.0 is still clunky, its graphics are too similar to those of the previous version, and it’s not as smooth, intuitive, or quick to respond as rival systems from Chevrolet, Hyundai/Kia, Volkswagen, and Honda. All 2019 Toyota Corolla hatchbacks come standard with Toyota Safety Sense 2.0, which bundles together automatic emergency braking, forward collision warning, pedestrian detection, lane departure warning, adaptive cruise control, automatic high-beams, and daytime cyclist detection. Models equipped with a CVT also get lane tracing assist and an upgraded adaptive cruise control system that works at all speeds and can bring the car to a complete stop. The adaptive cruise control system works well, but it leaves a larger gap between you and the car ahead than other adaptive cruise control systems. Even if you use the closest setting, impatient drivers have room to cut into the yawning gap between you and the car ahead. And the lane departure warning can get confused if you’re in a lane that’s about to split into two directions. Our two test XSE grade test vehicles checked in at $23,910 and $25,010 for the manual and CVT versions, respectively. That gets you a long list of standard features like LED headlights, leather upholstery, heated front seats, a 7.0-inch instrument cluster display, and 18-inch alloy wheels. Base SE models make do with 16-inch alloy wheels and cloth upholstery. Options on the XSE trim include adaptive headlights, a JBL audio system, a wireless charging pad, and integrated navigation. With a sportier driving experience and aggressive looks, the 2019 Toyota Corolla hatchback is a step in the right direction. However, from its disconnected steering to a multimedia system that’s logically laid out but slow to respond, there’s room for improvement. Add to that a cramped interior, and what you get is a compact hatchback that sacrifices practicality—what most consumers associate with hatchbacks—in favor of looks. This Corolla is an improvement over its predecessor, but it’s merely adequate. Toyota needs better tech for Android users and a less-disconnected driving experience to appeal to modern smartphone-wielding buyers. Why the **** is the 60-0 braking 11 more feet in the manual? Thinking aloud here but IMO this engine with a turbo should have been in the twins and the FA20 would have been better served in this. Seeing additional picture today I was thinking...Return of the FX16? I love this... would make a great first car. lvoe the styling and the sporty look..NO way I will complain about this car. I saw this car driving in front of me the other week. It looks like a mini Lexus hybrid car and the old gen Mazda3 combined which is somewhat a compliment. The wheels and tires could use help but over all it looked like a decent car for folks just starting out. The car looks kind of expensive from the back, but once you get a glimpse of the side profile it quickly reminds you it's just a Corolla. Definitely needs a hot version, but FWD has its limits in real world. I wonder how many people want hatches these days. Most people go mini SUV's. Did you see an SE or XSE? The 16s on the SE do look very low rent. The look with 18s is top notch, though. It visually needs nothing, IMO. Just a 2.0T from being a Japanese GTI.